The Buddhist path according to the ancient school of Indian and Tibetan Buddhism, the Nyingmapa school, has three vehicles and nine divisions within those three of practice and study. The three principle vehicles of Buddhist philosophy and practice are the Śrāvaka, Mahayana and Vajrayana. The practices ascend from foundational methods such as calm abiding meditation to the pinnacle of Buddhist practice, Dzogchen. 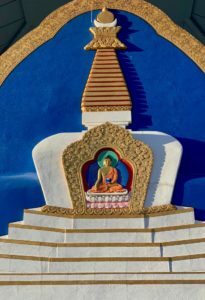 Ewam centers and the institute (shedra) offer courses and retreats in all three vehicles with the principal emphasis on creating the foundations for and the actual training in Vajrayana practice. Our practice lineage is an unbroken system of transmission from teacher to student going back to the Buddha and other great masters such as Padmasambhava and Yeshe Tsogyal who brought Buddhism into Tibet in the 9th century; all the way to our current master teacher Tulku Sang-Ngag Rinpoche and his authorized teachers. The path of our tradition is the journey to the realization of one's own fully awakened state.